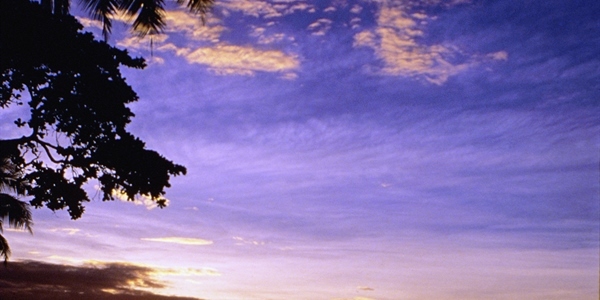 Offers a stable and bobust trips to the islands. 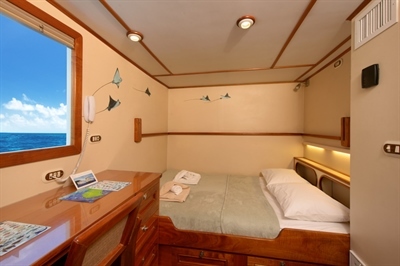 Join this spacious vessel for a journey around the Cocos Islands. You can expect a fairly rough ride to the islands but once there you can enjoy a trip full of adventure. The diving is very remote and untouched. 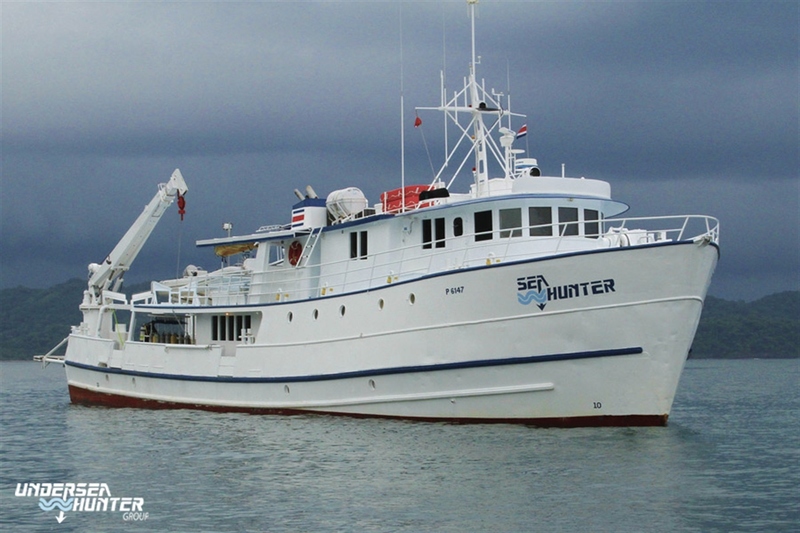 M/V Sea Hunter is a stable and robust vessel previously used to serve the oil industry in Mexico. 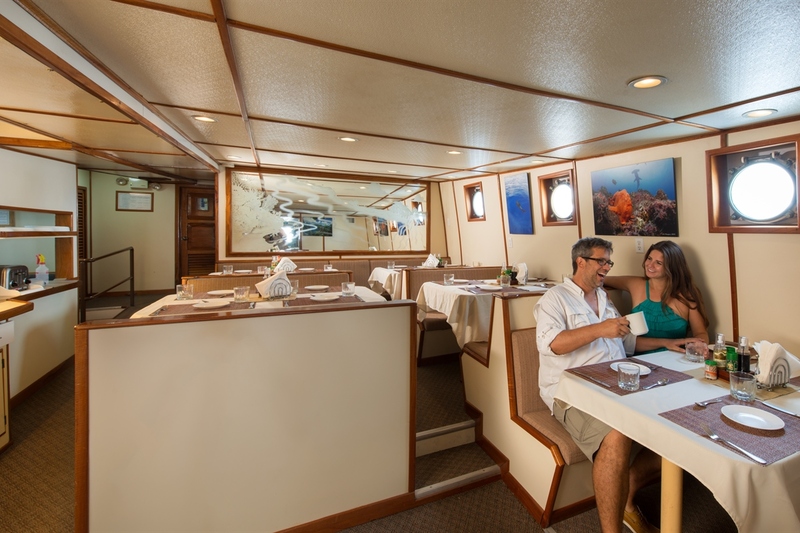 The redesigned boat combines powerful and functional machinery of a workboat with the comfort and modern interior of a liveaboard. 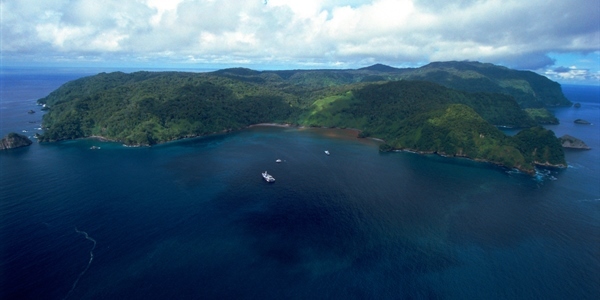 She is a 36 metre boat built for long range expeditions to destinations like the Cocos Islands on 10 day itineraries. 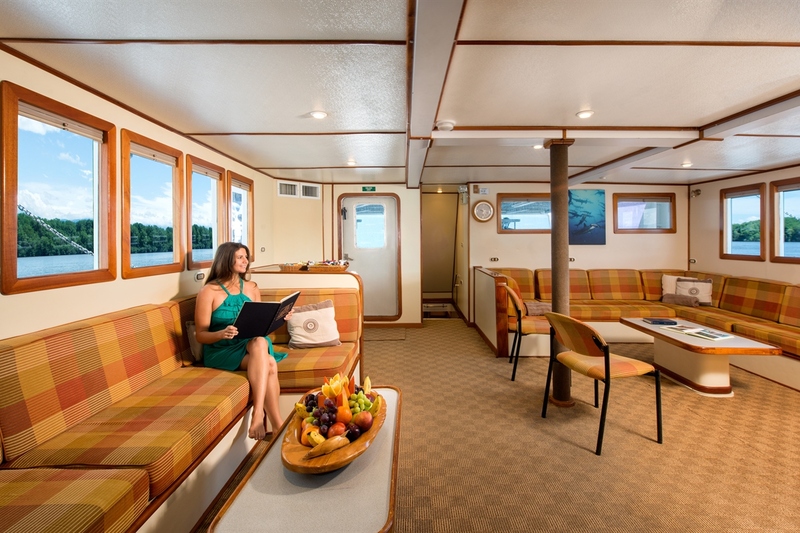 The 10 double cabins have en-suite bathrooms, drawers, shelves, circular porthole and air conditioning units offering space and comfort for 20 guests per charter. The 12 crew members aboard are friendly and experienced and will help with any questions or queries you may have. The dining room has 5 booths allowing 4 guests to be sat in each making it a cozy and enjoyable area to enjoy the range of American and local cuisine that is served up every day. The large lounge has tables, chairs and long padded seating areas for you to relax, doze or catch up with your fellow guests. There is a variety of nightly entertainment including slide shows, DVD’s and games which also takes place in the lounge area. The study area has comfortable seating and a library that provides guests with a relaxed and private ambience and a personal computer is located here to allow you to view and edit your videos and photos. 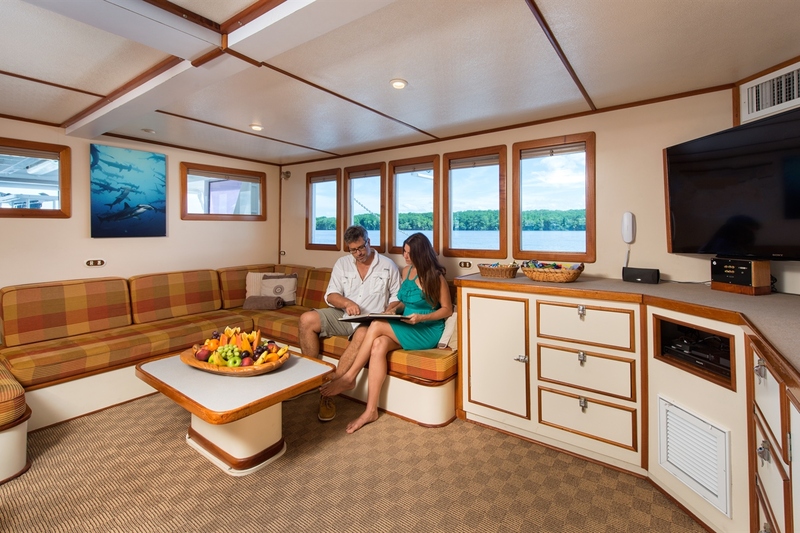 The dive deck is large and well-designed offering individual gear storage, large cubbyhole with electric outlets and protected areas for cameras and lights. The huge extended dive platform is often used as a swim deck or launching platform for the kayaks between dives, it is also a popular gathering place for sightings of large fish including shark activity. The sun deck is furnished with loungers, tables and chairs and is the perfect place to catch some sun rays or watch the sunset. The chefs use this area to host their BBQ’s along with dancing under the stars; the large open area was actually designed specifically for landing a helicopter. The DeepSee is a custom built submarine carrying 1 pilot and 2 passengers to 450 metres offering a unique experience at dives sites like The Wall and Everest. 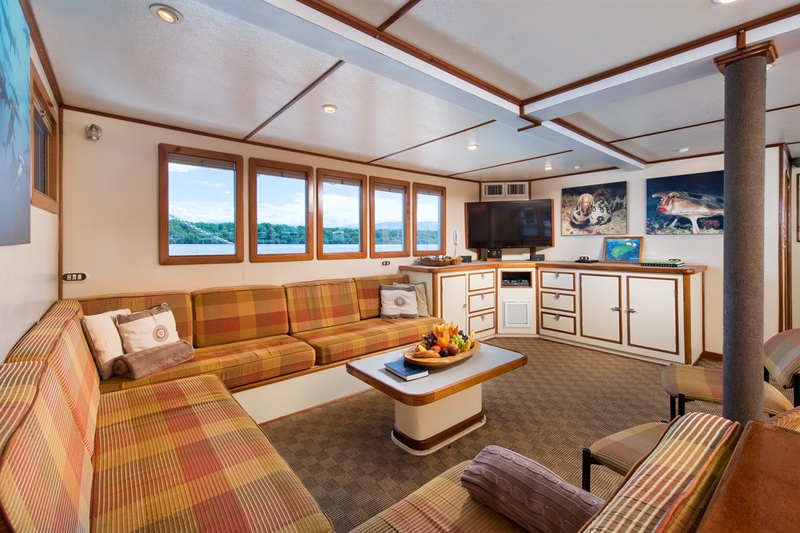 There is space for 20 guests aboard the Sea Hunter. All the cabins have heads and showers. 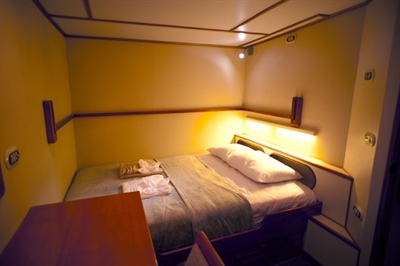 The cabins are furnished with drawers and shelves as well as having circular portholes. 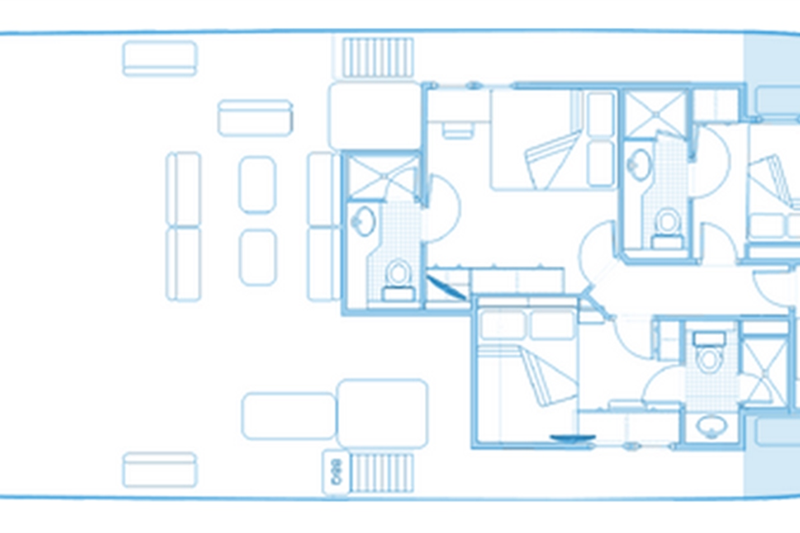 Double Cabin with one queen size bed. The room has large windows, is carpeted throughout, contains a satellite telephone for international calls and a flat screen TV with DVD player. 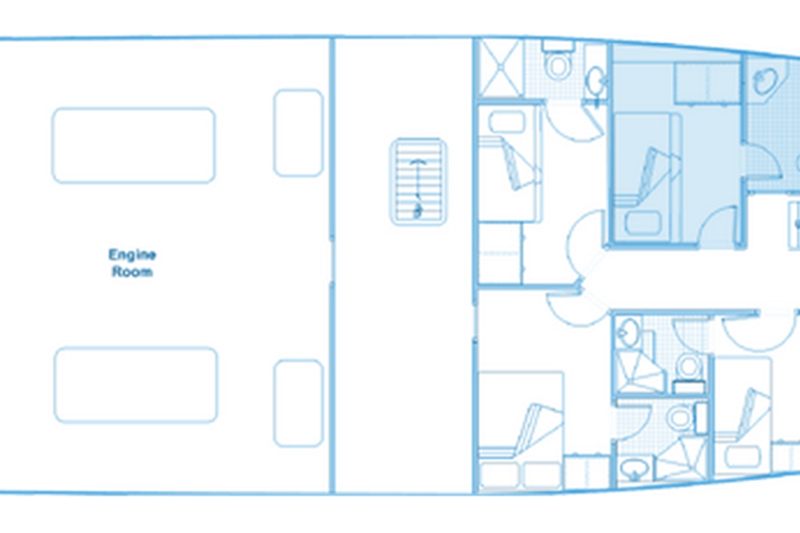 Double Cabin with one queen size bed. 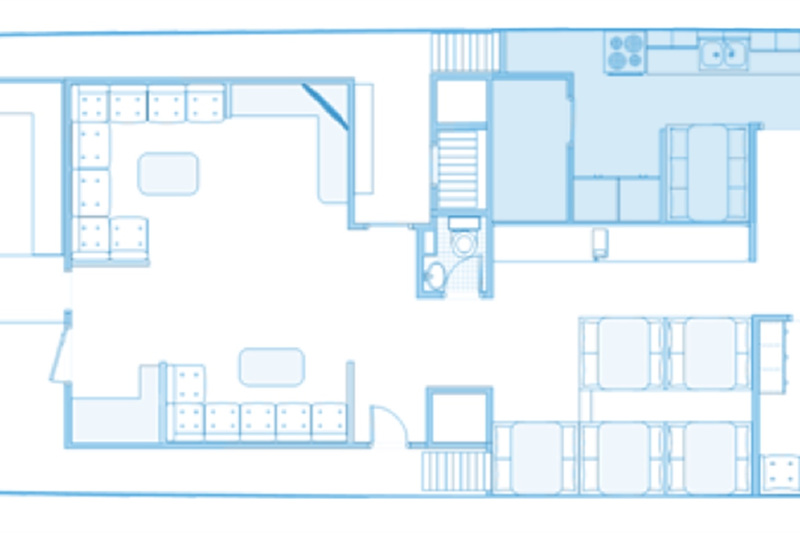 This cabin includes: Shelves, drawers and hanging hooks, a desk and chair and a luxury bathroom with granite surfaces. It is equipped with 110-volt outlets suitable for your electronic equipment. The room has large windows, is carpeted throughout, contains a satellite telephone for international calls, a satellite connection to send and receive e-mails and a flat screen TV with DVD player. 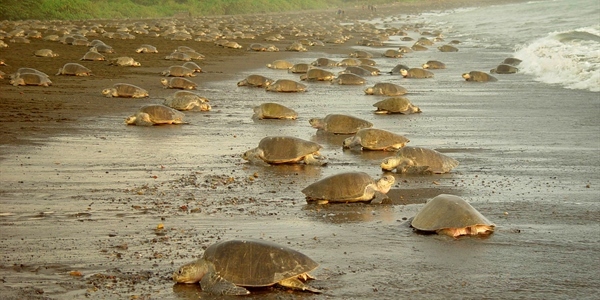 This beautiful island with its breathtaking marine life, including large pelagics, guarantees an unforgettable trip. 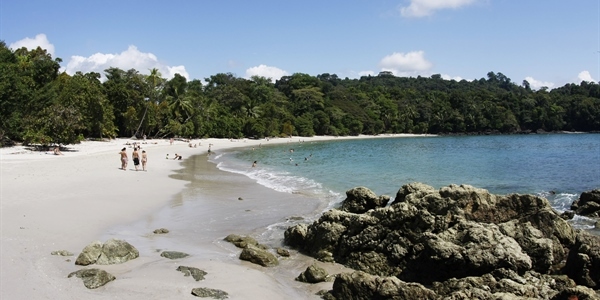 The Cocos Island Marine Park, a world heritage site, is a crown jewel of Costa Rica and was pronounced “the most beautiful island in the world”. 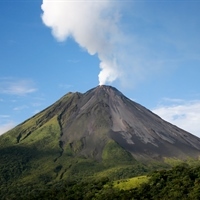 Spend a full 6 days diving the pinnacles around the perimeter of the Cocos Island with divers usually averaging three dives per day at depths of 18 to 30 metres. Countless fish, eels, lobsters and many other critters are residents of the hard coral reef and adjacent sand slope of Manuelita Coral Garden while the elusive rosy-lipped batfish can be found at Lobster Rock. The phenomenon of the 'bait ball' can also be observed when little bait fish seek protection by forming a spinning ball. The Sea Hunter was purchased in 1994 then eight months of extensive redesign and renovation was undertaken which turned the boat into the striking vessel she is today. 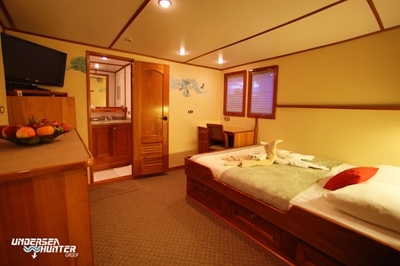 She has 10 guest cabins with private baths, furnishing live-aboard comfort for up to 20 passengers. 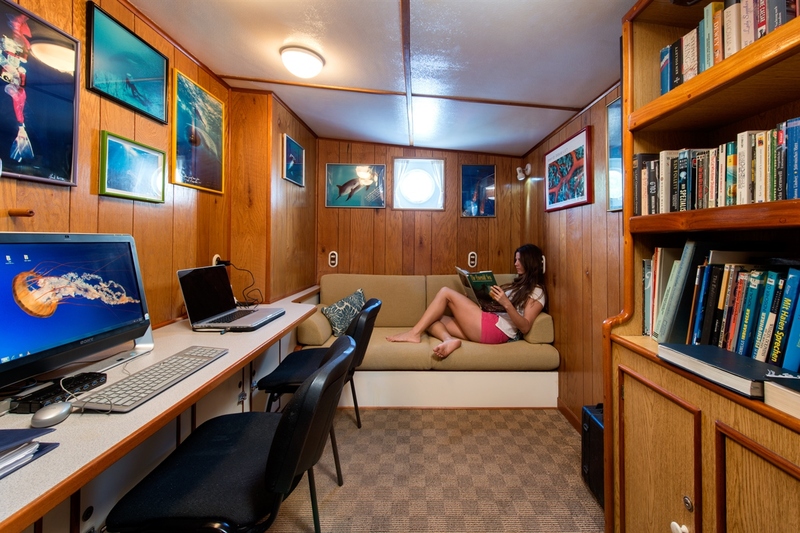 Her roominess and user-friendliness has introduced adventure divers, as well as professional photographers and cinematographers, to an entirely new level of live-aboard facility. Bajo Alcyone is the place to see the Hammerheads amongst other pelagic. The abundancy of resident sea life makes this site one of the island’s signature dives. Mantas, Whitetip Sharks, Whale Sharks, Silky, Blacktip Sharks, and hundreds of schooling Hammerheads are everywhere. 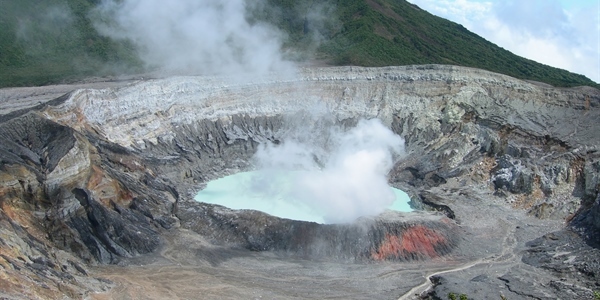 And underwater plateau, discovered by Cousteau when he visited Cocos Island, is home to a variety of sharks. Located near Wafer Bay, Dirty Rock is an impressive and exciting dive. Noted as one of our guests’ favourites, here you will come up close and personal with Whale Sharks that often cruise around this site. Dirty Rock is perhaps best known for the hundreds of Marble Rays and huge schools of Jacks that can be seen here. A swim through one of the schools is definitely worth the trip! Dos Amigos Grande is better known for its huge arch, a swim through so big that an entire diving group can move through it at the same time, Marble Rays swimming among divers, Eagle Rays feeding or mating, and schooling Hammerheads are typical scenarios at this memorable dive site. 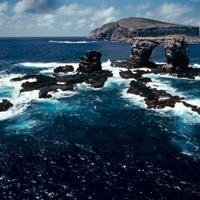 Los Amigos Pequena is another fantastic dive, where you can see Manta Rays, big Silkys and Galapagos Sharks. Huge Yellow Fin Tuner are often seen swimming out in the deep blue. 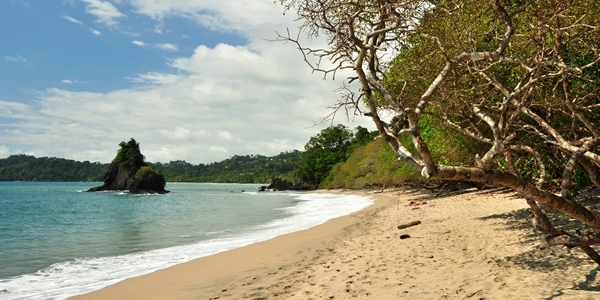 Manuelita is awesome, offering a variety of diving experiences all at the same location! In the shallow area, you can see hundreds of Whitetip Sharks during the night dives. Cleaning stations allow divers to come face-to-face with schools of Hammerheads. Schools of Snappers and Jacks are everywhere and in the deeper area, hiding places abound for divers waiting to watch all the action. A magical dive, day or night! 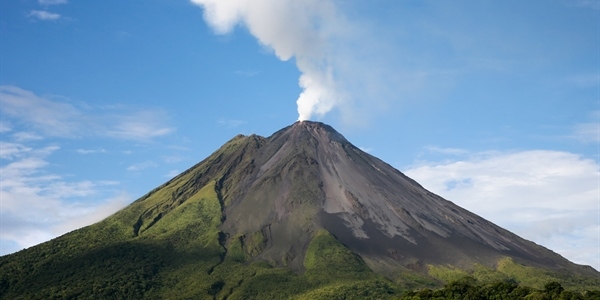 Punta Maria is a seamount that rises from a deep sandy area up to 90 feet on the main rock and with two pinnacles reaching up to 65 and 75 feet below the surface, which can only be visited when the current permits. It is a cleaning station for hammerheads and hosts large colonies of white tip sharks and marble rays. Viking Rock is a fantastic dive site where you can see Hammerheads, White tips, Eagle Rays, Turtles. This is a small helmet-shaped island on the northwest corner of Wafer Bay. A vertical wall leading to large step-like surfaces creates a variety of habitats where one can see both small creatures and large pelagic species. 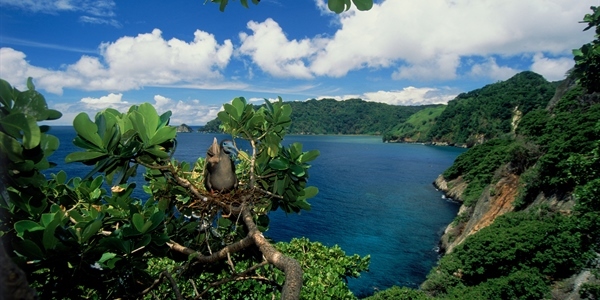 Among Cocos Island’s many attributes is a startling degree of biodiversity. This Island’s world-renowned waters explode with life; including innumerable white tip reef sharks, schooling hammerhead sharks, dolphins, mantas and marbled rays, giant moray eels, sailfish, and of course the occasional whale shark. Other common encounters are large schools of jacks and tuna, silky sharks, frogfish, silver tip sharks, marlin, Creole fish, green turtles and octopus. Underwater, this rock plunges down both sharply and gradually. 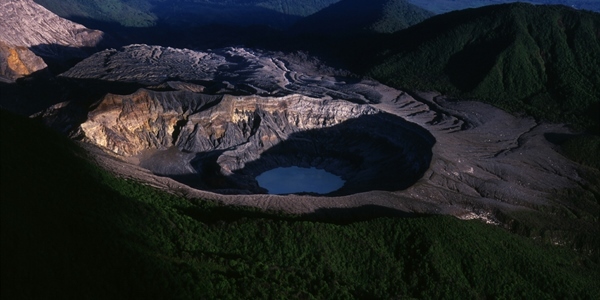 It is broken up with large ledges, some with sandy bottoms, and an outer pinnacle. The colourful, prolific fish life gives relief to the harsh contours of the reef. Sometimes the fish gather in such numbers that they momentarily blot out the sun. This phenomenon occurs when the little bait fish, upon being hunted, seek protection by forming a furiously spinning silvery ball. This is an attempt of a small species to intimidate and confuse a predator. In a bait ball you can find different bait fish and different hunters. Sometimes the bait fish will be trapped between the surface and the hunters below. This is when the boobies and frigate birds will join the feast. These special events can happen anywhere and at anytime. From the surface, this pyramidal rock looks exactly like its name, shark fin. This beautiful site hosts a huge school of thousands of bigeye jacks and is the home of an active colony of friendly marble rays. Because of the heavy surge often present on the spot, Shark Fin can only be safely dived between 40 and 120 ft.
On this finger-like rock, divers can easily approach large white tips lying on the bottom in great numbers. In the deep sandy area surrounding it, the elusive rosy-lipped batfish can be found between 90 and 120 feet. Manuelita dive site has a boulder formation where you will find hammerhead sharks along with other marine life including lots of White Tips, Marble Rays and schools of Creoles. A great day and night dive. Known as the dive site that never sleeps! Known for being a hammerhead cleaning station. 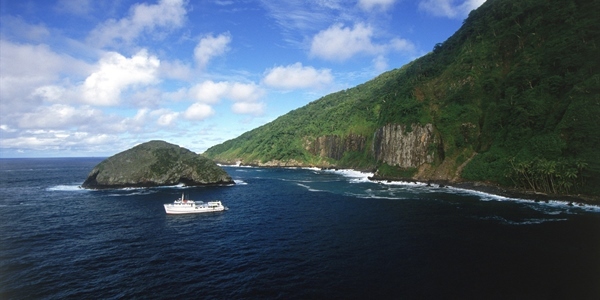 Located south-east of Cocos Island, below Big Dos Amigos dive site. The visibility is 20m. This dive site often suprises divers as the open sea current first reaches the island at this point bringing in a wide variety of marine life. Bajo Dos Amigos is a seamount shaped like a king's crown; this is the only place where black coral colonies can be watched at safe depths, between 100 and 130 feet. Definitely not an easy place to dive, due to the strong currents normally present on this site, we will only visit here during the dry season.